Andes mints are like a little slice of heaven right here on earth. (If you don't know what they are - you need to check them out.) They are small chocolates with thin layers of dark chocolate and cool mint. They are the perfect ending to any meal. When a waiter or waitress shows up at my table and presents me with an Andes mint at the end of my meal - it makes me ridiculously happy. (It doesn't take much.) After I finish my little happy dance, I immediately start the negotiation with my kids to try and "buy" their mints from them. Apparently, I'm not the only one who boasts a great admiration for the Andes mints though. They're popping up all over the place. You can even buy the crushed candies in bags in the chocolate chip isle at the grocery store. They are so good that they really shouldn't be saved just for an after dinner palatte cleanser - they should BE the dessert. 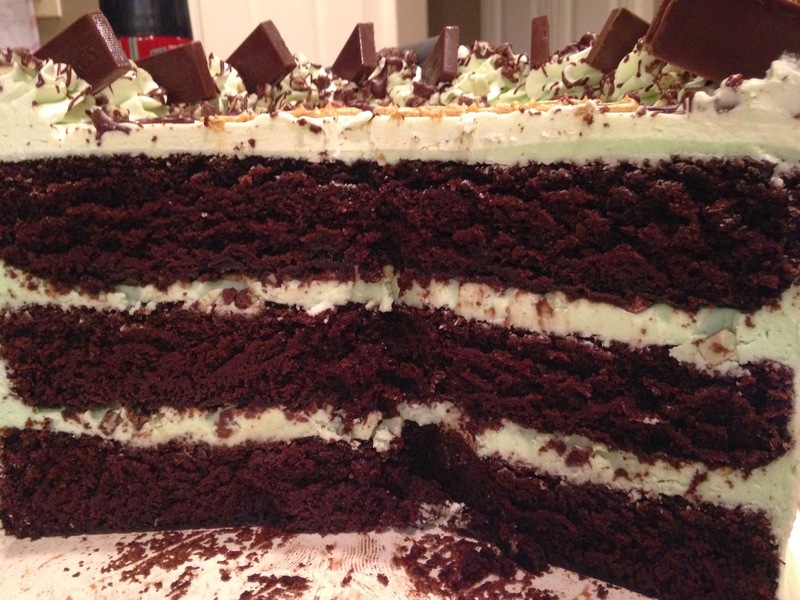 That is the very reason that I came up with the idea for my Chocolate Mint Cake. 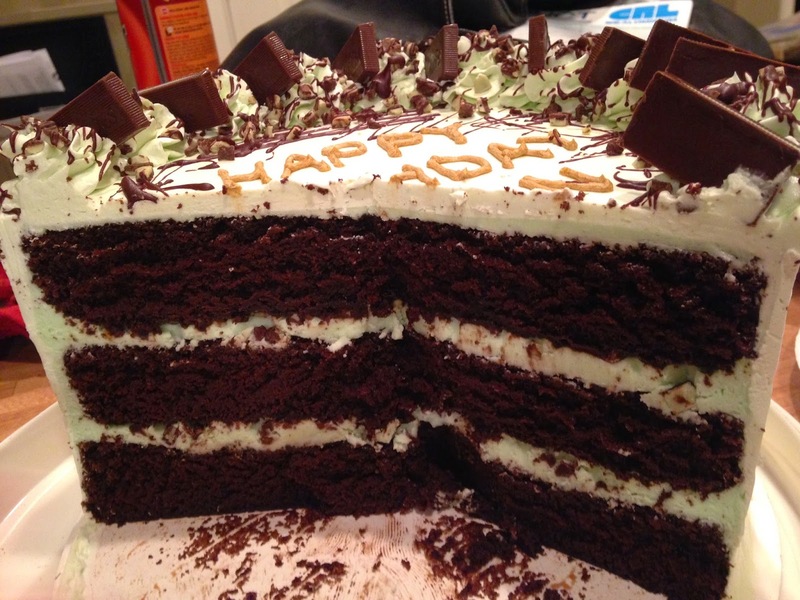 Layers of rich, dark chocolate cake and cool mint buttercream with a some crushed Andes candies in the middle for a sweet little crunchy surprise. What could be more perfect? Combine cocoa, flour, baking soda and salt. Cream butter and sugar. Add eggs, one at a time. Add vanilla. Add dry ingredients, alternating with sour cream. Divide between 3 cake pans. Prepare a batch of mint buttercream. 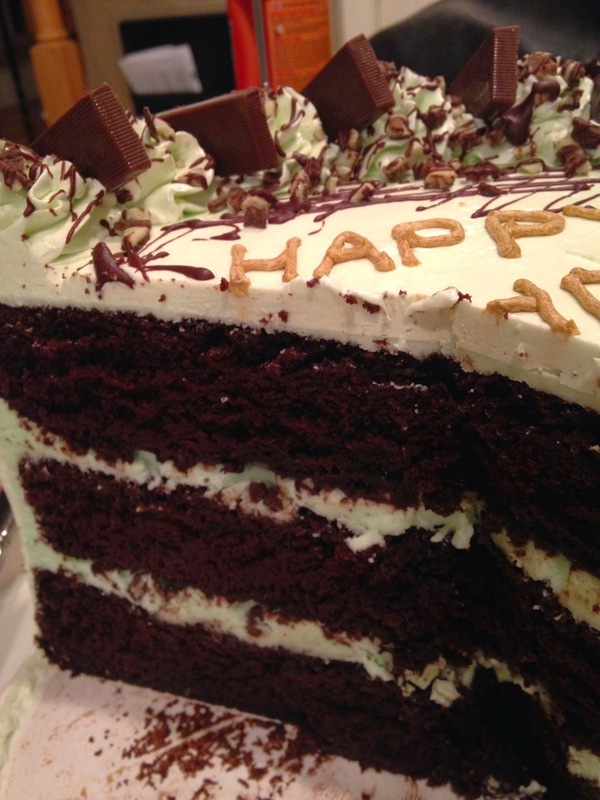 Spread a thin layer of buttercream onto the bottom layer of cake. Sprinkle with crushed andes mints. Top with a third cake layer. Spread a thin layer of icing all over cake. Refrigerate at least 30 minutes. Spread another layer of icing over cake and decorate as desired.